Preparing the garden for winter consists of cleaning up and covering. Although it may seem not much is going on in our garden over the winter months, there is still abundant life going on underground and inside nooks and crannies we can’t see. Properly preparing the garden for winter will ensure a lively one in the spring and summer. Follow a few of these tips to prepare the garden for winter. Keep polyspun material like this Gardeneer Harvest-Guard in case early frost happens to protect tender annuals and vegetables still going in the garden. Move ceramic and clay pots into dry areas so they won’t crack when it freezes. Good terra cotta is somewhat tolerant depending on temps, but it is a good caution to take to know they’re protected. Are your perennial container plants hardy enough? Pick perennial plants two zones hardier than the zone you’re located for containers kept year to year. Help those plants by lining the pots with insulation such as bubble wrap. Place pots up next to a house or on a concrete patio; the stone will absorb heat. I’ve had pansies last through winter and the next spring by doing this! Mulch the containers over the soil. You can also place containers out in the garden and completely mound over the whole pot with mulch. Research or ask a gardener about the best time to prune your species of shrub or trees. Depending on the weather, you can still plant trees. 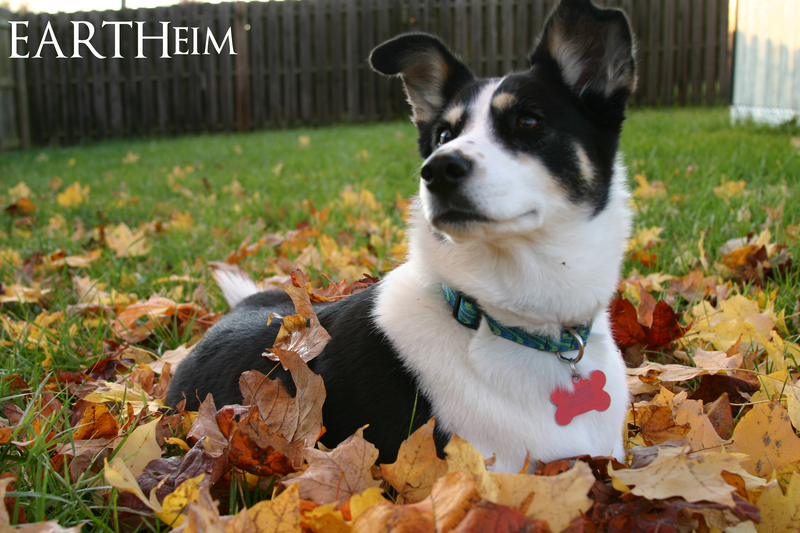 Fall is also the best time to fertilize and seed the lawn. For less hardy evergreens, create burlap wind shields. In Kentucky, this may be appropriate for boxwoods and Japanese Cedars. If you make your own shields, you can use garden staples like these to help secure the fabric to the ground. Put some stones (or even bricks) near less cold hardy plants such as lavender. The stone will absorb heat and help the plant. Evergreen boughs can used as a second layer to prevent your bulbs from shifting from freezes and thaws. If you do this in the front yard, just be wary that a neighbor could turn you in for ‘trash and debris’ in your yard. (I had this happen). Take cuttings of annuals to have for next year. Do a good last weeding. If the weed hasn’t seeded yet, this will prevent lots of weeds coming up next year. If you fertilize (such as with Rosetone), go ahead and stop fertilizing two months before first predicted frost in your area. 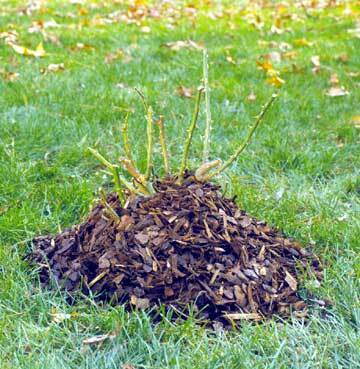 For roses you can also mound mulch 6″-12″ high over the root ball. Do this when the ground will begin to freeze. For roses that need extra protection, place a type of cylinder around the rose. This can be done with burlap held with stakes, plastic, metal, or pre-made ones like this by Eaton. Fill this container over time with mulch and/or leaves. You can continue to add more as the weather becomes colder. This is important if there is no snow cover to protect the ground. You may do the same with less cold hardy figs. I do recommend removing spent vegetable plants from the garden and not composting them. This is especially for ones that have become diseased over the summer or were infested with bad bugs. Keeping these around could create a larger outbreak next season. This is likely on tomatoes, potatoes, green beans, and squash. Do not compost this matter, discard appropriately. 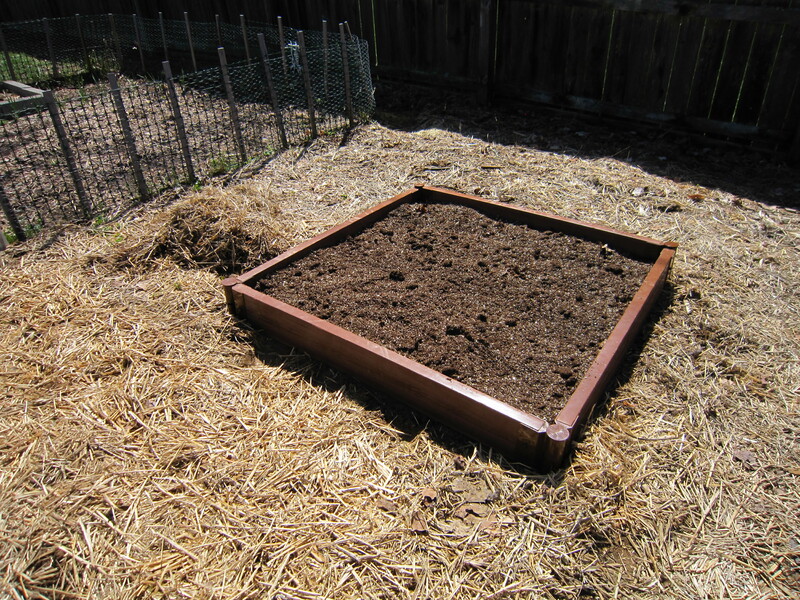 Lay straw or wood shavings over the vegetable garden bed for the season. I do not recommend hardwood mulch or chips because they do not break down as much and remain large pieces. This layer will help keep the soil temperature even or from freezing as much which will keep microbial action happening. In the spring when the sun becomes warm, pull back the mulch to allow the soil to warm. Plant a cover crop. Baker Creek Heirloom Seeds have a variety to choose from. For any root crops left in the ground, add a layer of straw, pine straw, or wood shavings over top. In the vegetable garden, lettuces, spinach, cabbage, onions, broccoli, Brussel sprouts, potatoes, beets, radish, carrots are still good to let grow in light frosts. Add compost and coffee grounds to build nutrients over winter. Coir, or coconut fiber is great to add to garden soil. Plan for next year’s season! In the meantime, start learning how to have a garden all through winter! Prepare your rain barrels for freezing weather by draining them/unhooking them/etc. Some people leave them out over winter if its mild. If you have consistent freezing temps you want to drain it and at least let the spigot freely drain. It is better to turn it upside down to keep water out, and best to store it indoors to preserve its longevity. Unhook hoses and drain. You can put a drink koozie over the spigot to protect it from freezing and cracking the pipe (or these nicer looking special covers). Also drain irrigation systems. If you have animals that stay outdoors a lot, add straw or cedar shavings into their sheltered area. Use a tarp as a wind shield or as another layer of protection. Clean patio furniture and cover with special made storage covers or store inside. The furniture will last a lot longer and require less maintenance.